Works by village authors and musicians make perfect Christmas present ideas. Bromsgrove historian Revd Alan White has re-published one of his books by popular demand. The Worcester and Birmingham Canal: Chronicles of the Cut is a comprehensive history of the canal, with insights into its construction, management, administration and uses – and the reprint contains an additional appendix on the building of the Ariel Aqueduct at Selly Oak. Revd White, the Historian of the Worcester-Birmingham & Droitwich Canal Society and honorary assistant priest at Tardebigge, first published the book in 2005 after 30 years of research, and second-hand copies have been selling at up to £100 each. The new edition (£25) is on sale at Waterstones Redditch and Worcester, Foto Factory in Bromsgrove, Tardebigge Church at service times, or from Revd White on 01527 877955. * Alvechurch UFO experts John Hanson and Dawn Holloway have re-released Volume 1 of their Haunted Skies series. Covering 1900–1959, this revised and updated edition is packed with intriguing cases from the early years of the UFO mystery. John has also written a book in collaboration with Colonel Charles Halt, former Deputy Base Commander at RAF Woodbridge/Bentwaters Airbase in Suffolk, where an incident described as “Britain’s equivalent of Roswell” occurred in 1980. In The Halt Perspective, Col Halt speaks candidly about what really happened. * The latest edition of local history magazine The Bromsgrove Rousler is now available, packed with fascinating articles including a history of the radio transmitters at Wychbold and Bromsgrove’s own Napoleonic warrior. Priced at just £2.50, it is available from WH Smith, Oxfam Bookshop, Foto Factory and Banner Foods in Bromsgrove, plus Burcot Garden Centre, Blackwell Stores, The Tea Shop in Barnt Green, Kennedy’s Hardware in Rubery, and Catshill Post Office. * If you want to support local musicians as well as authors this Christmas, there are a couple of cracking albums to get your hands on. 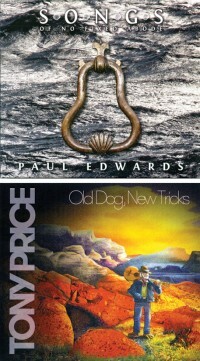 Then there’s Old Dog, New Tricks, the debut album by Alvechurch musician Tony Price, created in collaboration with producer Dave Howard and mixing blues, country, soft rock and Americana with some unexpected twists.